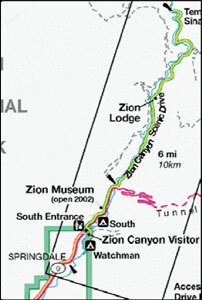 In 2004, a major rehabilitation of the main road through Zion National Park in Utah was scheduled to take place. 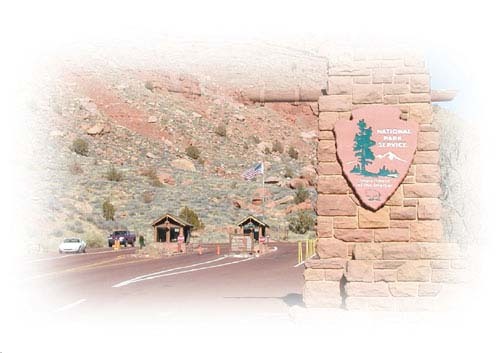 The work, beginning at the south visitors’ entrance and extending into Zion Canyon, was to include the widening and structural repairs of certain sections of the existing road and milling/paving operations over a 11-kilometer (7-mile) segment. The impact on visitors entering the park through the town of Springdale was a major concern, whereas traffic congestion on roads beyond the entrance station was not a concern because visitors are required to park and use the free shuttle bus service. Park administrators were concerned about significant work zone-related delay at the south visitors’ entrance, where recurrent queues were present even without the planned roadwork. The original traffic control plan called for shutting down one of the two visitor entrance lanes during construction. The National Park Service wanted to avoid an 0.8-kilometer (0.5-mile) queue extending into the town of Springdale during roadwork. A queue of this length would affect traffic in the town as well as employee access to the park. QuickZone was used to estimate the length of the queue and number of vehicles in queue for the peak tourist months of June, July, August, September, and October. Results from the analysis indicated that queues reaching into the town of Springdale were likely in these months without a change to the proposed traffic control plan. Due to financial and political constraints, construction was delayed. However, due to QuickZone analysis of the Zion project, engineers have begun to reevaluate the construction phasing and propose a variety of strategies. As new ideas develop, project engineers will analyze them in QuickZone to determine which will have the least impact on park visitors and employees. QuickZone can analyze queuing on roadways that include entrance booths/stations. QuickZone analysis results provided quantitative estimates of impacts on both the park (reduction in entrance fees) visitors (increase in delays). QuickZone analysis results motivated project staff to seek alternatives to the original traffic control plan.